Our bookstores feature Aneesha's book and many other interesting books, related to body- and breathwork, as well as a huge selection of our favourite Osho Books and CD's. Aneesha's book "Tantric Pulsation: the journey of human energy from its animal roots to its spiritual flowering" celebrates Aneesha’s almost fourty years of experience working with neo-Reichian methods of energy release, combined with meditation. It contains both theoretical and descriptive information about Pulsation, and Tantric Pulsation. If you ever were in a workshop or training with Aneesha, you probably had the joyful experience of singing with her. Blessed with a beautiful voice, Aneesha loves to bring song, dance and celebration into the world and into her work. 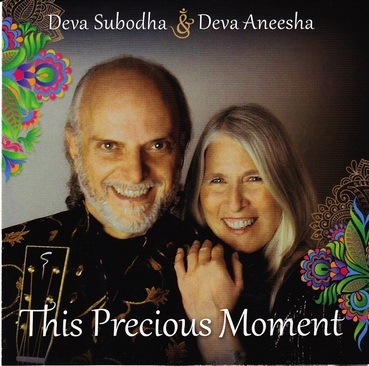 Due to the many requests for recorded music, Aneesha teamed up with her old friend Deva Subodha, a successful and accomplished singer/musician from Italy, and together they recorded "This precious moment", a beautiful collection of Sannyas and Celebration songs. Our partner blissbubbles.com came up with some fantastic designs for joyfully devoted Pulsators, just like you! Why not show the world that you just loooove breathing - or Pulsation, for that matter. Blissbubbles has two printing and delivery centers, one in Germany (Shipping to Europe and worldwide) and one in the United States (Shipping to the Americas and worldwide). Please choose the shop nearest to you in order to minimize shipping costs.